When I was in kindergarten, the teacher had a laminated Cookie Monster necklace. At the end of the day, she’d give the necklace to one child to wear home. The mother of the marked child was the designated snack provider for the next day. Now I could be remembering it wrong, but I’m fairly certain the moms only had one evening’s notice to come up with some sort of a snack. Usually it was something like Saltines or Nilla Wafers, but one time it wasn’t. One time it was criss-cross peanut butter cookies. They tasted really good to me then because I’d never had them before. The taste and texture was imprinted and I’ve spent many years trying to reproduce it. I don’t think I ever will be as satisfied with the cookies as I was as a little kid, but I can’t eat criss-cross cookies without thinking of kindergarten and that in itself is kind of nice. This recipe is very basic, but it will produce a fairly thick crisp peanut butter criss-cross cookie. The key ingredient is shortening. I use butter flavored for a little added flavor, but you can use regular if you want. You can also add a bit more peanut butter to intensify the peanut butter flavor, but if you do, the cookies might not be as crisp. Preheat oven to 350 degrees F. In a mixing bowl, cream the shortening, peanut butter, and both sugars. Stir in the egg and vanilla. In another bowl, stir together the flour, baking soda and salt, then add that mixture to the peanut butter mixture and stir until incorporated. Add some peanuts (however many you want) if you feel like it. Shape into small balls about ¾ inch in diameter and place balls a few inches apart on parchment lined cookie sheets. Wet a fork with water and shake off excess. Press the damp fork into cookies and make deep criss-crosses. If fork dries, dampen it again and continue. Bake for about 10-13 minutes or until golden brown. Remove from cookie sheet and place on a rack to cool. Criss-crosses were done when I was a kid, and that was long before nut allergies were known to be a problem. 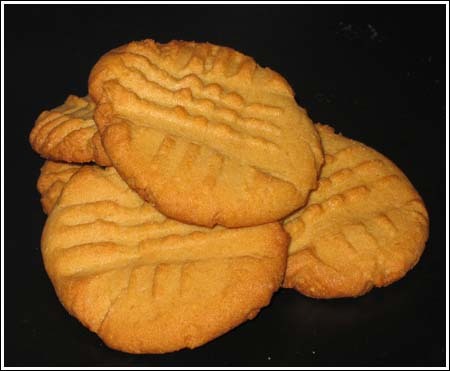 Whenever I see cookies with the fork markings, I always think of peanut butter cookies. Oh, I also dip my fork in granulated sugar after each criss-cross. Adds a nice little sparkle. I think the criss crosses were to “smash” the cookie so it’d cook more evenly! This cookie takes me back to the days. I was wondering if anyone knew of a peanut butter cookie that was made out of Captain Crunch peanut butter cereal. Also , another cookie that when you take a bite out of it , you crunch on bits of candy cane. I tried to experiment on a butter cookie and added crushed peppermints, but the candy melted. Anyone out there know these recipies?? There is a PB cook-off thread on Egullet and someone linked to this recipe. I linked to your blog because you made the pillsbury winner. I really need to pick up some shortening. We used the butter/shortening combo all the time when I was growing up, but when I first moved out of the house (and especially when I lived in TX), I almost never baked. Now that that I’m baking again, this recipe has convinced me that the purchase of Crisco is essential. Especially since it doesn’t just come in a tub nowadays. I love PB cookies. This recipe looks similar to my grandmother’s, except hers is doubled what yours is. mmm. Mmmmm peanut butter cookies. I might have to add some chocolate chips though. I can’t get enough of the chocolate-peanut butter combination. Anna, have you ever made the “magic in the middles” from the KA Cookie Companion? I bake for coworkers and those are one of my bestsellers (those and my chocolate chocolate chip cookies), though they are rather time-consuming.